Brief notes of martyrs of Karbala and Kufa with Imam Husain (SA). The Battle of Karbala took place on Muharram 10, in the year 61 AH of the Islamic calendar in Karbala, situated in present day Iraq. The battle was between a small group of supporters and relatives of Muhammad’s grandson Hussein ibn Ali and a much larger military detachment from the forces of Yazid. He was known as Habib Ibne Mazahir bin Re’aab bin Al-Ashtar from the lineage of Asad Abdul-Qasim Al-Asadi, aged 70 years. He was one of the faithful companions of the Holy Prophet (s.a.w. ), who after the Holy Prophet (s.a.w. 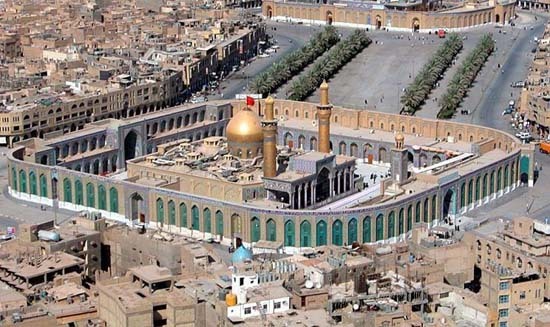 ), always remained with Ameerul-Momineen Ali and migrated to Kufa when the Capital was shifted from Madina to Kufa, and accompanied Ali in all the battles he had to fight against the rebels and traitors. His ideal faithfulness and sincere devotion to the Holy Imam has many glorious details. He was called ‘Muhammad-e-Azghar’ or Abdullah from Laila daughter of Mas’ud son of Hanzala son of Manath son of Tameem. From Basra son of Abi Obaida, whose father had been the constant attendant on the Holy Prophet (s.a.w.). The slave who was purchased and liberated by the Holy Imam, was the scribe engaged to write communications from the Holy Imam. Who was one of the companions of the Holy Prophet (s.a.w.). A very old, pious, and devoted companion of Amirul-Momineen, Ali Ibne Abi Taleb, one of the prominent noblemen of Kufa. He was the one who came to the Holy Imam begging most humbly to permit him to get martyred for he wanted to die in the way of the Lord and show his face to the Holy Prophet (s.a.w.) on the Day of Judgement. The details about the faithfulness and the devotion of Borair are many. From the famous ones among the faithful devotees to the Holy Prophet (s.a.w.). He was the follower of Muslim-bin-Aqeel in Kufa. Since Muslim was arrested, he hid himself until Imam Hussain (a.s.) arrived in Karbala, and reported himself to the Holy Imam and got martyred. The one who was attending on Amirul-Momineen in the battle of Siffin. Along with his son, Martyed at Karbala. One of the greatest devotees of the Holy Imam (A.S.). One of the companions of Ameerul-Momineen came to the Holy Imam and fell down on his feet and prayed to be permitted to be martyred. The liberated slave of Abi-Zar, who after the death of Abi-Zar, joined the Second Holy Imam and thereafter he remained with Hussain and had come to Karbala with Hussain. He was trained under Abi-Zar and was a very pious devotee of the Holy Imam (A.S.). Of the tribe of Bani Tameem. One who was in Yazid’s army. Seeing the Devil’s forces decided to attack the Holy Imam which he never thought that it would ultimately happen, left the ranks of the Devil’s forces and joined the Holy Imam and was martyred. The liberated slave of Hazrat Hamza the uncle of the Holy Prophet (s.a.w. ), had come from Madina along with Hussain to get martyred. Of a group from the tribe of Hamdan. His grandfather was one of the faithful companions of the Holy Prophet (s.a.w.). A very brave nobleman of Arabia. He went into the armies of the Devil, and found his own uncle there. His uncle asked him: ‘have you come to kill your uncle?’ He replied ‘Yes! You are my uncle, no doubt but God is my Lord and you have come here against Him.’ He killed his uncle. Along with him three others from the enemy’s ranks joined the Holy Imam. All were martyred. One who had already paid allegiance to the Holy Imam at the hands of Muslim was martyred in Kufa, Habib left Kufa and joined the Holy Imam on his way to Karbala and got martyred. Of Basra from the tribe Bani Sa’d, famous nobleman in Kufa. He was the one who carried the communications of the Holy Imam to the pious ones of the devotees of the House of the Holy Prophet (s.a.w.) in Kufa. He was the one who carried the message of exhortation from the Holy Imam to Ibne Sa’d in Karbala. A sincere devotee of the Ahlul-Bait who was a devoted companion of the Holy Imam. He was a noble personality very much revered and respected by the people. He was a noble chieftain of his tribe, a man of great influence in Kufa. In the beginning he was attached to the Third Kalif Othman. Once returning from Hajj, he met the Holy Imam and became a staunch devotee of Hussain. He is the one who bade goodbye to his wife Dalham daughter of Amru, liberating her with a divorce to go to her relatives, and he joined the Holy Imam and got martyred. The details of Zohair’s devotion to the Holy Imam needs a lengthy note. Son of Areeb one of the faithful companions of the Holy Prophet (s.a.w.) and also a traditionist. A very pious and brave noble personality enjoying the trust and the confidence of the people. Of the tribe ‘Kalb’ one of the devotees of Amirul-Momineen Ali in Kufa. These twin brothers had come from Kufa employed in the forces of the Devil to fight Hussain. Later they left the ranks of the Devil’s forces and joined the Holy Imam and got martyred. After the martyrdom of Amirul-Momineen, he remained attached to Imam Hasan and later after the martyrdom of Imam Hasan, he remained devoted to Hussain and got martyred. He volunteered to be martyred for the Truth. A noble personality with a high degree of fidelity and valiance. A noble and very influential personality in Kufa uniquely brave. He was very helpful to Muslim bin Aqeel in Kufa. He was the gentleman who carried Muslim’s letter from Kufa to Hussain and remained with the Holy Imam until he was martyred. He was the man who, while the Holy Imam offered his prayers in the field of action (Karbala) stood in front of the Holy Imam and received the arrows from the Devil’s forces, on his breast, protecting the Imam in prayers, and got martyred. A cousin of Zohair al-Qain, He went to Mecca with Zohair and when on his return from Mecca, Zohair decided to join the Holy Imam, he accompanied him and got martyred at Karbala. A man of very noble conduct and character endowed with strong will and prowess. A very pious personality fearing none but God. A truthful and a very reliable gentleman. A staunch devotee of the Holy Imam. He carried Hussain’s letters to the devotees of the Ahlul-Bait in Basra. Ibne Ziad the Devil’s governor of Basra caught him and this faithful servant of the Holy Imam got himself willingly martyred (at Basra). A noble, highly respected, god-fearing and a brave personality. He fought and fell seriously wounded, and was lying unconscious, the enemy thinking him dead had left him, but when he returned to consciousness and heard the rejoicing of the Devil’s forces shouting that the Holy Imam had been killed, he got up, and fought and got martyred. These two cousins from Kufa joined the Holy Imam and got martyred. A very brave gentleman who got martyred in the very first attack from the enemy. A lion-hearted brave gentleman who was faithful to Muslim bin Aqeel in Kufa. After Muslim’s martyrdom, he joined the Holy Imam and was martyred along with him. One of those six who along with Hur Ibne Yazid-e-Riyahi had joined the Holy Imam. One of the most pious devotees of Amirul-Momineen, and one of the noblemen of Kufa. He was one of those who helped Muslim Ibne Aqeel in Kufa. With his liberated slave Salim, both the devotees of Amirul-Momineen in Basra, joined the Holy Imam and got martyred. Of the Anmari-e-Khash’ami tribe. A well-known noble personality in Kufa. He came out of Kufa with Ibne Sa’d but joined the Holy Imam and get martyred with him. He had come to Kufa from Medina, and joined the Holy Imam. His wife also accompanied him to serve the Holy Ladies. When Abdullah was martyred, his wife sitting at the dead body of her husband said “O’ Abdullah! Thou hath entered Paradise, take me along with thee.” The good lady had not finished her lamentations when a slave of Shimar delivered a blow on her head with an axe and she was martyred. These two brothers were the noblemen of Kufa. Their grandfather, Harraq, was one of the faithful companions of Ameerul-Momineen. They came to the Holy Imam and joined the noble cause and were martyred. Alongwith Abdullah bin Zaid-e-Abdi. Obaidullah bin Zaide Abdi, Yazid bin Sabeet al Abdi. These great men, well-known and highly respected ones of their tribe came and requested the Imam to permit them to drink the cup of martyrdom along with him, and got martyred. One of the faithful companions of the Holy Prophet (s.a.w.) and a Traditionist and a faithful devotee of Ameerul-Momineen. One of those who carried the letters of the devotees to the Holy Imam. He came to Hussain and got himself martyred. Came out of Kufa along with Ibne Sa’d but later joined the Holy Imam and got martyred. One of the brothers of Hazrat Abbas, the third son of Ommul Baneen. Joined the Holy Imam on his way to Karbala and was martyred. When these four person marched towards the camp of the Holy Imam, Hur asked the Holy Imam for permission to stop them from getting near the camp for they were coming from the enemy’s ranks. The Holy Imam miraculously said: “Obstruct them not, they are coming to me with a good heart. They are my devotees.” They joined the Holy Imam and were martyred. Of the tribe of Hamdan. He reported himself to the Holy Imam and was martyred. One of the faithful companions of the Holy Prophet (s.a.w.) and also of Amirul-Momineen. The son of a liberated slave girl of Hussain. This lady after having been liberated by the Holy Imam, was married to a gentleman and brought her son Qarib and presented him to the Holy Imam and Qarib was brought up by the Holy Imam. He was martyred along with the other devotees, offering himself in the way of the Lord. A well known noble of Kufa. These three brothers were the devoted companions of Amirul-Momineen, who were with him in all his expeditions against the infidels and traitors. They came from Kufa and offered themselves for the noble cause and achieved martyrdom. Of the devotees of Amirul-Momineen, came from Basra and was martyred in the way of God. A very pious personality from a group of the Asadi Tribe, extra-ordinarily brave, faithful and one of the sincere and faithful companions of the Holy Prophet(s.a.w.). He reported himself to the Holy Imam, from Kufa, and was martyred. A very noble personality known for his piety in Kufa. A good reciter of the Holy Qur’an and a very brave, God-fearing, influential and powerful noble of Kufa. Son of Ziad bin Omar Jahni one of the aged companions of the Holy Imam. When people began deserting the Holy Imam on the Night of Ashoora, this old devotee of the Holy Imam remained and achieved martyrdom. Who accompanied Qasim bin Hasan from Madina and got martyred. Of the devotees of the Ahlul-Bait in Kufa, escaped from the town at night and joined the Holy Imam at Karbala. A companion of Ameerul Momineen. Reciter of the Holy Qur’an and Traditionist. A noble personality known in Kufa for his piety, escaped from Kufa and joined the Holy Imam in Karbala. A great devotee of Holy Imam, who always remained by the side of ABBAS the Standard Bearer of Hussain. He could not bear the least disregard for the Holy Imam, from any one in the Devil’s forces. A liberated slave of Ameerul-Momineen. He was presented to the Holy Prophet (s.a.w.) by the King of Persia and the Holy Prophet (s.a.w.) presented him to Ameerul-Momineen who freed him. He came to Karbala and got martyred. The Turkish liberated slave of Harse Madhaji. A pious gentleman, a good reciter of the Holy Qur’an, who came to Karbala, presented himself to the Holy Imam and was martyred. One of the nobles in Kufa. A staunch devotee of Ahlul-Bait. A very pious personality who joined Hussain from Kufa and was martyred. A very pious devotee of Ameerul-Momineen. A learned poet. His father and grandfather were faithful companions of the Holy Prophet (s.a.w.). The Third brother of Abbas the Standard Bearer of the Holy Imam (A.S.). One of the two young sons of Muslim bin Aqeel the Deputy of the Holy Imam who were martyred in Kufa. Son of Muslim bin Aqeel Ibne Abi Taleb. His Mother was Roqiah daughter of Ali through his wife Sahba from Yamamah was martyred when he went to save the Holy Imam. The grandson of Muslim bin Aqeel, the Deputy of the Holy Imam to Kufa. Son of the Imam Hasan bin Ali (as). The son of the Second Holy Imam Hasan, a young boy who ran out of the tent to save Hussain when he was being martyred, and was martyred before the Holy Imam. This great lion-hearted son of the Lion of God in his qualities and position in Karbala, is next only to the Holy Imam Hussain (a.s.). The unique grace bestowed by God specially on this Great Martyr, is such that any one who prays for God’s immediate help at the time of danger, invoking the divine grace in the Holy name of ABBAS, is immediately heard and helped. There are millions and millions of those who have had their prayers heard by God, and who are still being graced by the Divine Mercy through the medium of this Great Holy Soul, ABBAS the faithful brother and the Standard Bearer of the Holy Imam at Karbala. Let any one try his own luck even today by invoking the Mercy of the All-Merciful Lord in the Holy name of this Saintly son of Ameerul-Momineen Ali. His holy shrine in Karbala stands today as the resort for the sure rescue of his sincere devotees to get the help from God at the times of unavoidable needs, risks and dangers. In short, all the details about the greatness of Abbas and the unique divine qualities he was exclusively distinguished with, cannot be given in this brief work. He was next only to the Holy Imam in Karbala. The ‘Alam’ or the Banner which he held on behalf of the Holy Imam, was the Standard of Islam or the Truth, which is hoisted by the Shias, popularly during the mourning season of Moharram, and is revered as do the faithful subjects of a good King as a token of their loyalty to him. The Banner being the Standard of Truth is only revered and respected and never worshipped as wrongly imagined and depicted by some ignorant ones. Worship in Islam is due to none but the One, the Only True God. The six month old baby son of the Holy Imam, martyred in the very lap of his father whose martyrdom no human heart can bear without shedding tears. The divinely promised and prophesied Martyr of the ‘Zibhe Azeem’ (The Great Sacrifice) in the seed of Abraham through his son Ishmael, in the lineage of Ishmael through Muhammad the Last Apostle of God, Ali the Ameerul-Momineen, the First of the Holy Imams and Lady Fatema the Lady of Light.